Malloy closes in on the boys while Cuba Gooding Jr. enlists the help of his buddy Jason Alexander. Tensions reach a boiling point and everything comes to a head on the set of Ben and Jack's film. While Alan and Diana enjoy a romantic dinner, the boys are threatened at gunpoint, and an unexpected turn of events leaves them tasked with unforeseen challenges. This show has helped revive my confidence in the success and future of Comedy Central seeing as its going though big transitions now and for the next few years with the loss of Colbert, the coming loss of Stewart, the end of Kroll Show, though it was inevitable, just in the same way that Key and Peele and Workaholics will be gone in a few years as well. 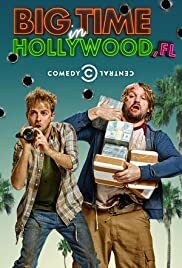 Hollywood, Florida is in its first season and I really believe its bringing some fresh air with its consistent story line as opposed to a random scenario each weak like Workaholics or Always Sunny(I admit Sunny has stayed hilarious for 10 seasons). I feel like I'm having the same eagerness for next weeks episode like many people were for Empire, and thats a good thing for a network! But whats really reassuring is the confidence Ben Stiller has taken with his aging attitude which has translated into less shits to give. This has definitely made for some hilarious situations as well as some pretty good film making including the back and forth comparisons between scenes for hilarious dark comedy effect in the 5th episode which I just got done watching. Ultimately the show has everything you could want, a fat scapegoat who wears short shorts, untimely deaths of characters who you start to get attached to, and gratuitous use of unspecified drugs, if you're watching Comedy Central chances are your tastes are already pretty poor so this will be great!